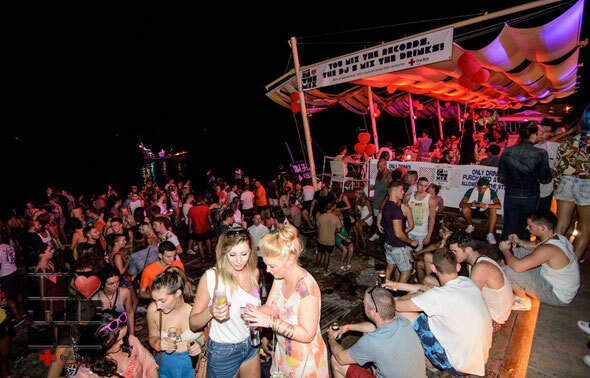 Café Mambo is staging the third Mambo In The Mix charity event in conjunction with its 20th Anniversary celebrations on Tuesday 9 September 2014. The legendary sunset destination and free party hub has once again joined forces with the Red Cross in Ibiza and Formentera to invite some of the world’s biggest electronic music DJs to offer their services for free for the charity event. Café Mambo has raised over 60,000 Euros in the last two years. The Mambo In The Mix charity event, in aid of Ibiza and Formentera’s less fortunate communities, is a night where DJs, workers and tourists alike come together to give their time and money to help a great cause. Playing with the theme of mixing things up, last year’s event saw some of the world’s biggest DJs take part in this great cause, working behind the bar and grill instead of the Mambo DJ booth for the evening, while the public volunteered to mix the beats, many of whom received coaching from the A-list names present, in exchange for a charitable donation. This year there will also be a raffle with many prizes (tickets are available for purchase online now) plus other fun and games. DJs in the past years have included Carl Cox, Armin van Buuren, Paul van Dyk, Eric Prydz, MK, Laidback Luke, Miss Kittin, Cristian Varela, Kevin Saunderson, Dimitri Vegas, Nervo, Danny Howard, Judge Jules, Roger Sanchez, Jamie Jones, Seth Troxler, Philippe Zdar from Cassius, M.A.N.D.Y. and Mark Fanciulli and this year’s line-up promises to be equally big.